Our Adult Jiu-jitsu classes are all 1.5 hours long, giving you enough time to properly warm up and cool down, and still have plenty of time for training martial arts techniques and applications. The result is a class that provides you a well-rounded work-out while training practical tools for self-defense. Our training integrates all aspects of physical fitness: coordination, agility, endurance, strength, flexibility, and balance. Throughout the course of your Jiu-jitsu training, you learn what you need to know to defend yourself, while raising your personal awareness and self-confidence in our graduated self-defense program. As part of our program, you learn to apply your skills in accordance with Canadian laws. Because of this, as well as the practical self-defense applications of our style, Can-ryu Jiu-jitsu, we have a number of law enforcement officers who train with us. More about martial arts training for police. Cardio Warm-up. We warm you up with one of many types of cardio exercises, including skipping, stair climbing, running, etc. This is followed by joint rotations and gentle movement stretches to help prepare your body for training. A proper warm-up is important for any martial arts work-out as it helps prevent injuries while training. Strength Training. Once you're warm, we choose from a series of exercises designed to help strengthen and tone your whole body, using medicine balls or your own body weight for resistance. Striking / Blocking Techniques. In this part of the class, you train in a number of practical striking techniques on padded targets or through partner drills, including easy kicks, open & closed hand strikes, knee & elbow strikes, as well as blocking techniques. More advanced students also sometimes work on sparring exercises. Breakfalls. This is by far one of the most practical, "real-world" skills you can learn from a martial art. Not only does it teach you how to fall safely when training Jiu-jitsu takedowns and throws, it also helps protect you when you fall in day-to-day life, from slipping on ice to snowboarding or cycling wipe-outs (lots of stories of these have been shared by our students). As you age, the chances of injury that can result from falls increases too, so it's a very practical skill to learn. Regular practice helps reinforce your ability to fall safely until it becomes second nature. It's also an awesome workout! Applied Self-Defense. Working in partners or small groups, you'll learn how to apply self-defense skills against a variety of attacks, including body holds & grabs, punches, ground encounters, even weapons! All the self-defense techniques we teach are designed to be in line with the 4 Tenets of Can-Ryu: Simplicity, Commonality of Technique, Gross Motor Skills, and Awareness of Additional Threats. More details about these principles. As part of each hold escape or strike defense in this section, we generally finish by controlling our partner, either by taking them to the ground or by gaining compliance through the use of joint locks. Stretching. At the end of class, we go through a series of body stretches to help relax your muscles, realign muscle fibres and re-establish their normal range of movement. It also helps reduce muscle stiffness/soreness that can occur after working out. Check out our training schedule for class days & times. White to Green: This level focuses on gross motor skills, teaching you all the basic fundamentals you need to defend yourself on the street and the foundations required for advanced learning. Green to Black: These levels reinforce the self-defense fundamentals learned at prior belt levels, adding more emphasis on fine motor skills and advanced training that develops your awareness and adaptive abilities. *We are currently taking new students in our Adult Jiu-jitsu classes, but please note that there are limited spaces available, so we cannot guarantee everyone a spot. Please contact us to make an appointment for two free trial lessons. Want to learn more about our approach to training? 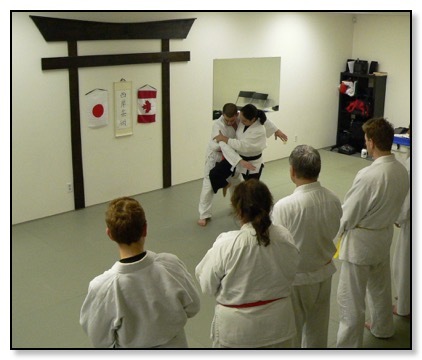 Read more about practical self-defense and traditional martial arts.